The King wants his son to learn responsibility and so sends him out to get a job in the real world. The Prince takes a job in a supermarket as a cleaner and falls in love with Angela, the owner’s daughter. Angela however is due to be married to Chuka as arranged by her parents, but her heart does not belong with him. The Prince (Jim Iyke) is betrothed to Tracey (Chika Ike) and his parents are adamant that they marry. Angela (Uche Umenyi) is betrothed to Chuka (Francis Ebiloma), a union that has been arranged by her parents. The Prince and Angela find a common bond through their experience of attempted forced marriage. It is them, not their parents that will have to spend a lifetime with the person that they marry, yet the their feelings are not taken into consideration. We see this lot in Nollywood; families often get involved in marriages based upon decisions that do not directly affect the couple, namely strengthening family ties and financial reasons. Boy walks into supermarket, sees girl and falls madly in love. Do you know how many times I have seen this in Nollywood? Uncountable times! This scenario is so typical Nollywood but so untypical of real life. Come on now if the supermarket were really the new falling in love spot then everyone would be hanging out in them. 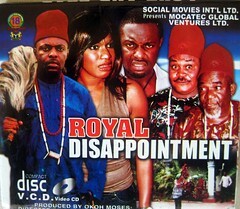 The whole love at first sight thing has been totally overdone in Nollywood. Let us see some really well developed loved stories. Love stories so real you feel as though you are breathing it. Love stories not characterised with Mr Biggs and horses on beaches. Let us see something different. The movie has a good message we learn that it is not wise to judge a book by its cover, at least that’s what my mother exclaimed when we got to the end of the movie. When you strip away titles and wealth and fancy clothes, a Prince can become a cleaner and no one will know the difference unless he lets you know that he is of royal lineage. We all love the same and bleed the same. Angela’s father once he finds out about The Prince’s background apologises profusely for his behaviour, however I got the feeling that he was only sorry BECAUSE the king was a Prince, which means that he should have never said sorry because it was a lie. Why should someone be treated different by virtue of birthright and not achievement? Do you know what is strange the front cover says Royal Disappointment and then on the spine it is called Love and Fear. Talk about confusion! The movie is predicable and starts of a bit slow, however it does get better as it goes one. There are some very funny scenes involving Angela’s father despairing over his daughter’s stubbornness and his run ins with The Prince. I would not recommend this movie as it is a story we’ve seen already a million times before and this time not told any better than any other time.